8 August 2008, at 9:16a.m. US - The Caskey’s Sunshine Farm has the best Cobb 500 fast feathering flock for the second successive year. The Caskey’s Sunshine Farm that produces hatching eggs for the Pilgrims Pride Natchitoches, LA complex has the top Cobb 500 fast feathering flock for the second year in a row. 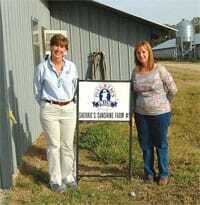 Vickie Crawford (left), Pilgrims Pride breeder manager, and Sherrie Caskey. The farm located in the Goldonna community is owned and operated by Greg and Sherrie Caskey. They built the farm consisting of four 40 ft X 400 ft (12 m x 122 m) houses in 2004. Sherrie runs the day-to-day operations while Greg works in their family construction business as well doing the repairs and maintenance on the farm. In the Cobb sold flock survey for 2007 the Caskey’s flock stood out among the 2,300 flocks covered with 183.01 total eggs, 179.80 hatching eggs, 87.28 % hatchability and 156.93 chicks per hen. Cobb-Vantress congratulates the Caskey family for a job well done and thanks them for their hard work. It also thanks Pilgrims Pride for its business and looks forward to its continuing relationship.